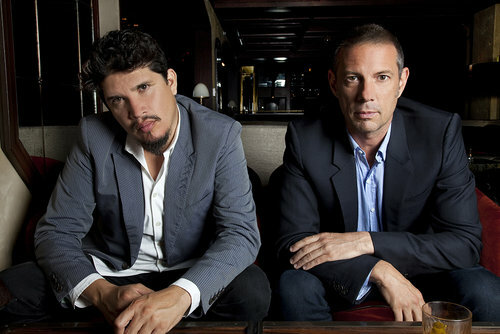 Rob Garza and Eric Hilton of Thievery Corporation have a way of combining genres like acid jazz, dub, trip hop, downtempo, electronica and bossa nova with unique international vocalists that is truly transcendent, showing an appreciation of cultural diversity. The talented DJs cleverly incorporate visuals with a wide range of musicians and vocalists to keep shows interesting and engaging, all while creating the ultimate mood music. Incredibly ambient, Thievery’s music ranges from chill to sensual to politically charged tracks. It all began back in 1995, when Garza and Hilton met at Eighteenth Street Lounge, Hilton’s bar in D.C. They met one night, started drinking and talking about a shared passion for the kind of older music that they loved. Other times, artists might send in their demos for review. Federico Aubele sent them his demo when he was living in Buenos Aires and then he came to D.C. and they produced his first record Gran Hotel Buenos Aires on their Eighteenth Street Lounge record label. This global influence is evident in Thievery music and lyrics in English, Spanish, French, Italian, Persian, Hindi, Portuguese and Romanian-quite the eclectic mix. Their new album, Treasures from the Temple, includes original recordings and remixes from the band’s Temple sessions in Port Antonio, Jamaica with vocal appearances by international singers LouLou Ghelichkhani, Mr. Lif, Sitali, Racquel Jones, Natalia Clavier and Notch.